Rick Wakeman – Keyboard Rock Legend, Composer, Broadcaster, Author and After-Dinner Speaker. Rick Wakeman was born in 1949 in Middlesex, England. He went on to become one of the most accomplished keyboard players and composers of his generation. After studying classical music from a young age, he enrolled at The Royal College of Music. However he left to start a session career – playing with bands such as Black Sabbath and David Bowie. After playing with a band called The Strawbs, Rick Wakeman joined the band permanently in 1970. Two albums later he moved on again and joined Yes. Yes had already released three hit albums, but their fourth, called Fragile was the first to feature Wakeman. The album and the single Roundabout taken from it were both big hits. Rick Wakeman also started releasing solo material at about the time of Yes’ next album Close To The Edge. A series of conceptual classic rock albums followed, including The Six Wines of Henry VIII and Journey To The Centre Of The Earth, which made him an international superstar. ‘Journey…’ appeared in the top 10 of virtually every country in the world. In 1974 he left Yes and went on to write film scores, musicals (1984 with Tim Rice) and even a huge concert on ice! The Myths and Legends Of King Arthur and The Knights Of The Round Table used a full orchestra and a choir of 50. It was held in Wembley Arena. Rick rejoined Yes for a few years in the late 1970s, and the band reformed again in 1989 after pursuing their separate projects. 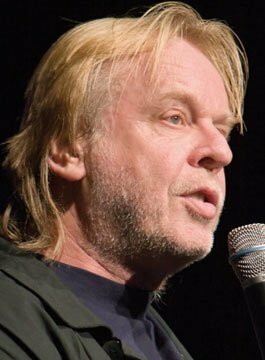 Rick Wakeman is equally well known now for his regular appearances on Grumpy Old Men and as a panellist and guest on many TV and radio shows. Experience music and humorous anecdotes from the keyboard legend. Rick is now available for selected after dinner engagements.